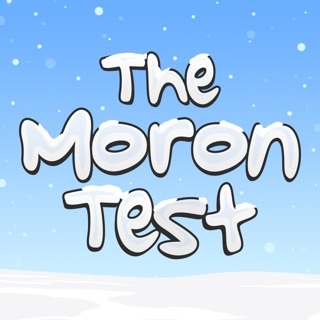 The world’s greatest word game is back with an all-new look! Fill in the blanks and be the funniest person in the room! 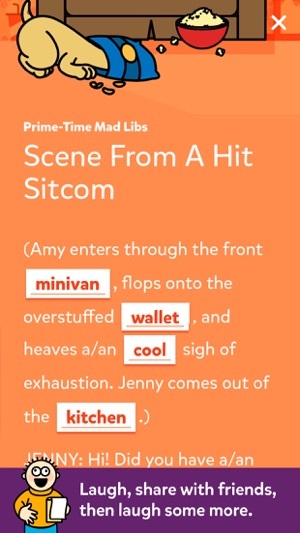 Bright, fun, and more engaging—it’s an even cooler Mad Libs app experience. 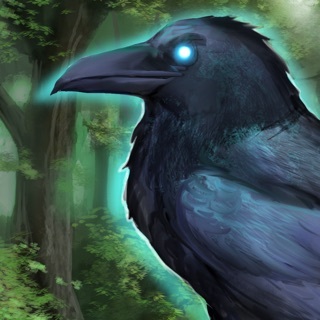 For the very first time, an original soundtrack and audio effects. 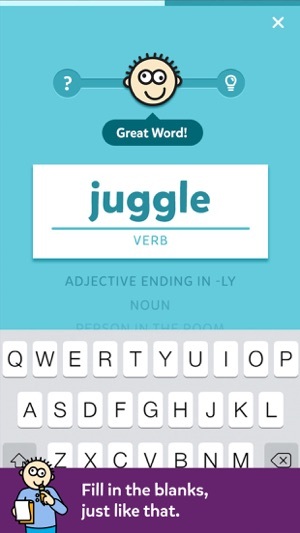 This game makes you seriously smart—you’ll learn how to make great, fun, smart word choices! 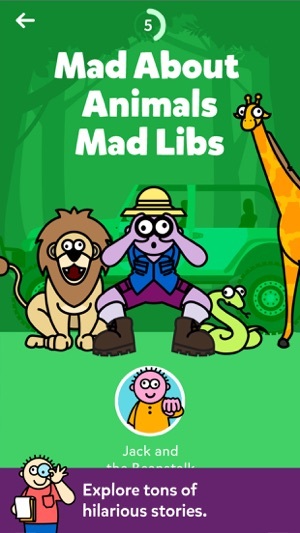 Thanks for your patience as we worked through some bugs—Mad Libs should be running smoothly again, so you can get back to creating the world's wackiest stories with your friends and families! I love this app so much I would give it 4 stars. What I liked about this app is Mad Libs is so entertaining, fun and educational. 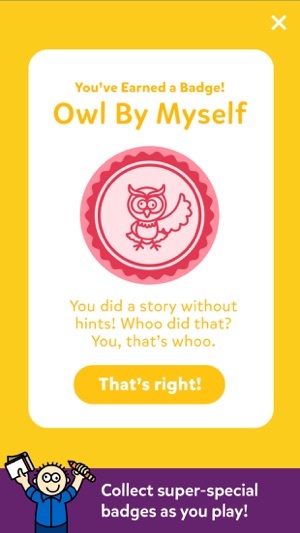 I though this app was entertaining and fun because it is a creative way to make your one stories. in the app it tells you to give a noun, adverbs, adjectives, ect. This app is very educational because it teaches you many examples of grammar rules. For example if it asks you a noun you have to give a noun like Pen. From there the app takes the different word you typed in for the rules and it combines them into a story. What I disliked about this story is after your finished with the free story's you have to pay for the other ones. I dis liked this because you should not have to pay for more stories That is what I liked and disliked about this app. Amazing, Though It Blacks Out For Me! This app gives the whole "Penguin" introduction, but then it blacks out, and then I can't even play! The reason I am giving it five stars though, is because it might just be my own phone acting funny, because the app worked perfectly on my cousin's cell phone! I adore the free 21 stories and the bargain of two dollars per 21 stories, yet in stores, they cost three to five dollars. And it's so much easier, how they sort everything out for you, and when you're filling in the blanks, you don't need to struggle to not read the dialogue. I also loved the pun "Phil N. DeBlanks"! It left me laughing! This app is awesome! These mad libs aren’t fun. Mad libs are supposed to be fun. The free ones are taken from informational passages. That’s not promoting your product well (in my opinion, at least). If those had made me interested or laugh, I’d be inclined to buy one of the other books. They are, instead, pretty much the opposite of what I want, and the disappointing quality makes me think that all of them will be like this. That’s not something I’m interested in by any means, and so I won’t be wasting my money on these. Question for the developers: why is this like this? Back when I was a kid (which wasn’t very long ago), doing Mad Libs was a fun way to pass time. You’d compete with your friends to see who could come up with the craziest story. This has none of that. You can’t have a crazy story without fun scenarios.